If you were going to draw up an economy that makes absolutely no sense, you’d start with a system where prices go up as demand goes down. Welcome to the world of prescription drug pricing. Data from Blue Cross and Blue Shield of North Carolina (Blue Cross NC) and the Blue Cross Blue Shield Association (BCBSA) shows that consumers are continuing to move away from brand-name prescription drugs, choosing more affordable generic alternatives. But the price tags on branded drugs are rising so fast, we’re still spending more on prescriptions – a lot more. 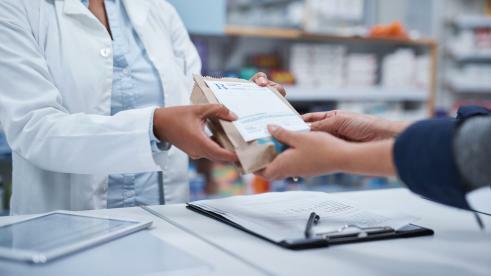 According to Blue Cross NC claims data, prescriptions for generic drugs in North Carolina increased from 74 percent of all prescriptions in 2011 to 87 percent in 2017, while the number of prescriptions for branded drugs fell by half, from 26 percent to 13 percent. 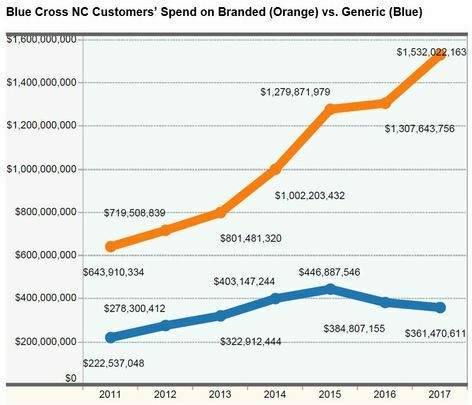 Still, Blue Cross NC customers spent $1.5 billion on branded drugs in 2017 compared to $361 million on generics. Despite buying nearly seven times as many generic drug prescriptions than branded, North Carolinians spend four times as much on branded drugs versus generics. That trend is reflected across the US, according to a new study by BCBSA. The BCBSA report, “Rising Costs for Patented Drugs Drive Growth of Pharmaceutical Spending in the US,” analyzes drug utilization from 2010-2017, including price changes and overall spending. According to the research, prescription drug spending increased 10 percent every year for Blue Cross and Blue Shield members across the nation over the past seven years, an overall rise of 73 percent.